Renovating and remodeling your bathroom can create a fresh new look for this essential room of your home. Choosing the right Houston shower doors and enclosures can enhance the appearance of your bathroom and can ensure the most comfortable and convenient results. 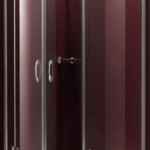 Here are some points to consider when selecting an enclosure or doors for your shower. The increasing popularity of Houston frameless shower doors may make them an appealing choice for you and your family. These sleek and modern installations are a must-have for many home buyers and may even increase the value of your home at the time of resale. By investing in frameless shower doors and enclosures, you can enjoy the benefits of a more beautiful bathroom now and may recoup some or all of your investment later. The size of your bathroom can play a determining role in the type of shower doors or enclosures most suited to your space. Hinged or pivot shower doors open outward and require additional space to ensure safety. Bifold shower doors usually open inward and can conserve space in cramped areas. Sliding doors and enclosures usually require a smaller architectural footprint and can be used in smaller bathrooms more easily. 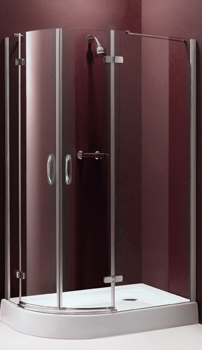 Frameless shower doors and enclosures are available in a wide range of glass types and finishes. Frosted and textured shower glass can provide added privacy for personal hygiene tasks. Clear glass offers a modern, clean look for most bathrooms. If you opt for a framed shower door and enclosure installation, you can choose from a variety of metal finishes and colors to complement your existing interior décor. Working with a company that specializes in shower doors in Houston can ensure the customized results you want and need for your bathroom remodeling project. Sliding shower doors and steps up to the shower can often provide added mobility for elderly family members or younger children who may have difficulty accessing the shower by themselves. By considering the needs of every member of your family, you can create the most practical solution for your bathroom renovation project. At Apple Glass, we create and install Houston shower doors and enclosures designed to your precise specifications. Whether you need a complete frameless shower glass enclosure installation or repair of your existing framed shower doors, the skilled technicians at Apple Glass can deliver the solutions you need at a price you and your family can afford. Give us a call today at 281-296-0600 in The Woodlands or 713-680-1400 in Houston to schedule a free quote. We look forward to creating the perfect shower enclosure for your entire family. This entry was posted in Showers and tagged Houston Frameless Shower Doors, Houston Shower Doors, Shower Doors in Houston. Bookmark the permalink.